Hofstra University | The New York Baroque Dance Co.
From April 6-9, a group of 12 Hofstra University dance majors performed a suite of Baroque dances that I put together as part of the Junior class’ repertory project. We rehearsed during the fall semester, took a break over the holidays, and picked it up again in February, getting ready for the Spring faculty dance performance. The dancers performed six pieces altogether: a minuet for the whole group (that I choreographed to a movement of Bach’s Orchestral Suite #4), La Bourgogne, La Forlana, the Sarabande d’Issee, La Bretagne, and a Contredanse/Commedia Finale (to an excerpt from the opera Alcione by Marin Marais). I had fun with La Forlana by setting it on four dancers instead of two and having the extra couple perform a mirror image of the original notation. For La Bretagne, I used six dancers instead of two and had my two side couples do the first part of the dance (the passepied) facing upstage and the second part (the rigaudon) facing downstage. It made for some nice spatial patterning. 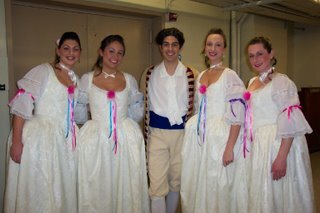 For the contredanse section I used several notations from the Dezais book and then we had some Commedia fun and games with four of the dancers donning masks to become Pantalone, La Signora, Isabella, and Columbina. All in all. it was a great learning experience for both the students and me. They did a terrific job and I was so proud!